Illustrated with color and black & white photos, tables & drawings. 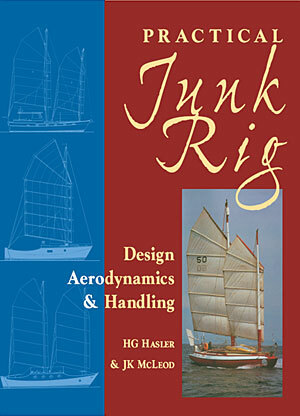 Tiller Publishing announces the re-publication of Practical Junk Rig, Design Aerodynamics and Handling, the first and still foremost major work on the fore-and-aft Chinese junk rig. H G Hasler (universally known as "Blondie") died in 1987 after completing Practical Junk Rig but unfortunately before its first publication. A Lieutenant Colonel in the Royal Marines, he was awarded the OBE for is services in Norway in 1940 and the DSO for leading a daring raid on German shipping in 1942. But it is for his original thinking and innovative work in other areas that he will be well remembered - cruising guides, inventing the modern yacht wind vane self-steering gear, founding the Single-Handed Transatlantic Race in 1960 and the Round Britain Race, and of course, his developmental work on the Chinese junk rig. Major Jock McLeod met Blondie Hasler in 1961 and they became close friends sailing Hasler's junk-rig Jester on Loch Ness where Hasler was setting up the first Loch Ness Monster investigation. McLeod became Hasler's partner in 1963 and was his enthusiastic disciple until Hasler's untimely death. He currently sails his own 47-foot Chinese schooner Ròn Glas (featured on the back cover) to further develop the advantages of the junk rig. He has made sic Atlantic crossing in her as well as cruising for many thousands of miles. Since Ròn Glas can be managed entirely from under cover, McLeod once boasted that he could cross the Atlantic in his pyjamas and slippers, for which the press dubbed him "Pyjama Jock."